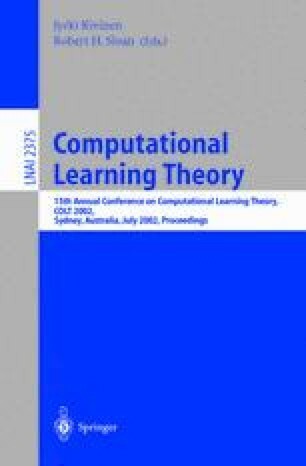 In this paper, we give a mistake-bound for learning arbitrary linear-threshold concepts that are allowed to change over time in the on-line model of learning. We use a standard variation of the Winnow algorithm and show that the bounds for learning shifting linear-threshold functions have many of the same advantages that the traditional Winnow algorithm has on fixed concepts. These benefits include a weak dependence on the number of irrelevant attributes, inexpensive runtime, and robust behavior against noise. In fact, we show that the bound for the tracking version of Winnow has even better performance with respect to irrelevant attributes. Let X ∈ [0,1] n be an instance of the learning problem. In the traditional algorithm, the bound depends on ln n. In this paper, the shifting concept bound depends approximately on max ln (‖X‖1).